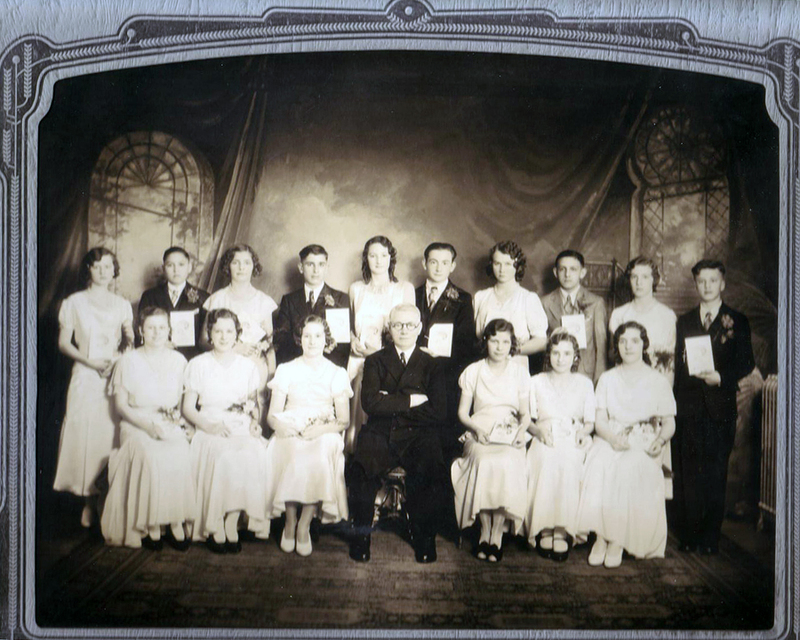 The German Congregational Evangelical Brethren Church Confirmation Class of March 20, 1932. Front row from left to right: ?, ?, ?, Reverend Conrad J. Wagner, ?, ?, ? Back row from left to right: Katherine Weber, ?, ?, ?, ?, ?, ?, ?, ?, ? Unidentified class members: Malia Schlitt, Edna Glass, Lucille Ruhl, Elma Blum, Esther Wacker, Anna Traut, Viola Lynch, Wilma Metzler, Rebecca Morasch, Bertha Schafer, Jake Schmidt, Adam Krieger, George Burbach, Alexander Fuchs, Jacob Jacoby. Photograph courtesy of Kris Zelinka (née Wunsch). Kris identified Katherine Weber (married name of Wunsch) standing in the back row at the far left.